Dr. B: Gatorade is possibly okay, but Gatorade has sugar in it, and it's not particularly good for people who might even get hypoglycemic, or might induce insulin secretion, and that insulin secretion will produce more hunger and they overeat. But as a temporary sport drink, it's okay when you're in the middle of a golf game to drink a Gatorade. It immediately gives you a bit of the minerals that you probably will have lost sweating. But nothing substitutes for water -- not a thing. No drink -- no coffee, no tea, no alcoholic beverages. Not even fruit juices. Each one of them has its own agenda. Your body is used to a fluid that has no agenda, because the body depends on the freedom of that fluid, water, because there are two kinds of water in the body. There is already occupied and engaged water, which is no good for new function. 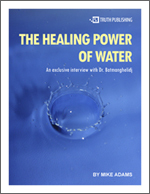 The body needs new water, or free water, to perform new functions. Now, when you give them sugar containing beverages, or caffeine containing beverages, both sugar and caffeine have their own chemical agenda in the body. They defeat the purpose of the need for water. Dr. B: I'm talking about soft drinks, I'm talking about sodas, I'm talking about caffeine containing coffee or tea. I'm also talking about alcohol, because alcohol actually stops the emergency water supply systems to the important cells, such as the brain cells. In the reverse osmosis process your body filters and injects water into the cells, and this is what I call reverse osmosis. And it has to raise the blood pressure for that in order to overcome the osmotic pull of water out of the cells, and reinject water into the cells. That's why we develop high-blood pressure in dehydration. And this process of reverse osmosis is stopped by alcohol. It stops the filter system. Dr. B: Certainly, Mike. I have written a book called Water Cures and Drugs Kill. It's a book that explains why dehydration is the cause of pain and disease, and how the pharmaceutical industry has camouflaged this information or covered it up and instead of letting people drink water, it advertises the use of their products, which actually do kill. Because recent figures have shown that prescription medications, when used according to the instruction of doctors, nonetheless kill over 106,000 people, and make 2 million people sicker than before taking the medication. And then there is another group who die from faulty prescriptions, incorrect prescriptions. So between them, about 250,000 people die from drug-related problems, medication-related problems. This makes the drugs the use of drugs the number three killer processes in the country -- protected and licensed killer process. After heart disease, which kills about seven or eight hundred thousand, cancer which kills about 500,000, drugs kill 250,000 people. Mike: So it's fair to say that pharmaceuticals, as packaged by modern medicine, are the third leading cause of death in this country. Dr. B: Absolutely, and they are useless, because most of the medication they are using is to cover up symptoms and signs and complications of dehydration in the human body. The human body manifests dehydration by a series of symptoms and signs, perceptive symptoms of dehydration -- in other words, brain senses dehydration, or tiredness when you haven't done a good day's work, or first thing in the morning when you want to get up out of bed and you're tired, you can't get up -- that is a sign of dehydration. Then anger, quick reaction, depression, these are all signs of dehydration, when the brain has very little energy from hydroelectricity to cope with the information or take action. These are some of the perceptive signs of dehydration. Then the body has its drought management program, which are allergies, hypertension, diabetes, and also immune diseases.